Mortgage Rate Armageddon continued this week, thanks mostly to the Fed and Mr. Ben Bernanke, who made it clear we will eventually have to fend for ourselves. Pundits already knew about a potential tapering of the Fed’s mortgage bond buying program (QE3), but now there’s talk of a complete wind down by mid-2014. As a result, mortgage rates skyrocketed once again – and now it’s getting ugly, really ugly. Notice anything different? 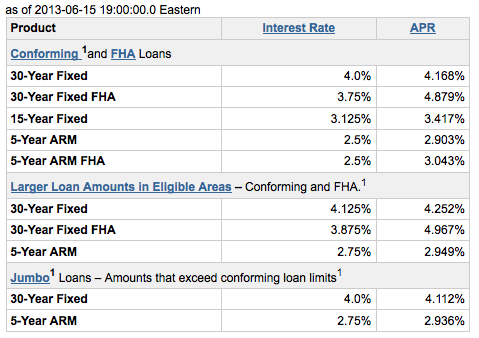 Rates are about a half a percentage point (.50%) higher across the board. The standard conforming 30-year fixed is now being offered at 4.5%, up from 4%. 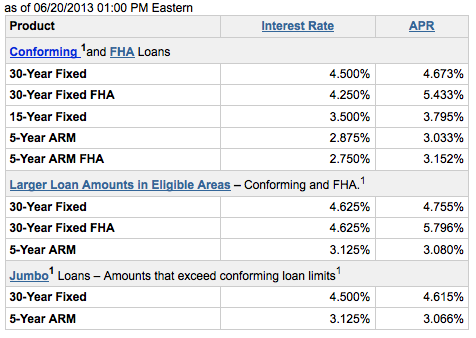 And the 30-year fixed for jumbo FHA loans is .75% higher at 4.625%. Yikes! If you didn’t already lock, proceed to kick yourself now. For those floating their rates, Godspeed. By the way, this mortgage rate increase is so massive that it has the potential to make prospective homeowners ineligible for their mortgages currently in process thanks to DTI issues alone. Check out my mortgage payment charts to assess the damage of this most recent rise. Update: It’s just getting worse, a lot worse. Here are Wells Fargo’s mortgage rates for Monday, June 24th. The 30-year fixed is nearly in the 5% range. Just an eighth away…Even the 15-year fixed is close to 4%. Funnily enough, conforming and jumbo mortgages are now priced the same. Yes, rates are still historically low, but now they’re just “low,” as opposed to ridiculously cheap. We’ve seen a near-1% rise in rates in about a week. That’s pretty rough. Should be interesting to see how the mortgage/housing market digests the news. Share your most recent mortgage rate quotes below in the comments section. Hi Colin, thanks for sharing this post. Ya, the mortgage rates are higher again. Again things to worry. Just an update – since posting, Wells Fargo has dropped rates on the 30-year fixed to 4.375%. 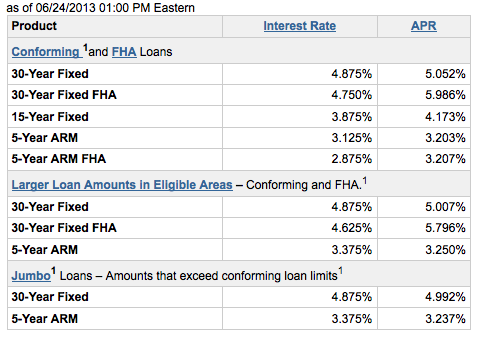 And most other rates are 3/8 to a 1/2 point lower. So it’s important to be patient and ride out “bad weeks” if you have time to float your rate, especially when rate movement was so exaggerated and aggressive last week. It was likely an overreaction. Looks like interest rates leveled out since that initial jump…they’re even down from previous highs. Hopefully they stay where they’re at for a while.